From November 30 until December 2, Armada Music presents a special theme weekend on Spotify. On that weekend, the Armada Radio play list will transform into the ‘Trance 75 – Best of 2012’ play list. 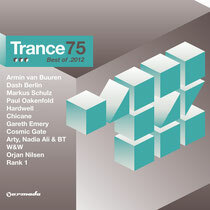 Based on the physical release of the latest edition of the ‘Trance 75’ series, the play list will feature the trance highlights of 2012. Armada Music, being voted ‘Best Global Record Label’ for the fourth year running, is one of the leading record labels within the trance and EDM scene. The ‘Trance 75 – Best of 2012’ album brings fans of the genre the tracks and remixes of Armin van Buuren, Dash Berlin, BT, Paul van Dyk, Gareth Emery, Markus Schulz, Gabriel & Dresden, W&W, Paul Oakenfold, tyDi and more. The play list will be a mix of future classics and timeless anthems, all released in 2012. It’s available on Spotify via www.armadamusicradio.com.